I know I haven’t been posting as much on the blog here these days, so if you want to keep up with The Offalo, please make sure to follow my Instagram: @theoffalo! But do keep an eye on this space, as I am working on redesigning and relaunching my blog in the near future! Sunday the 22nd – Eastside Food Festival: I can’t believe this event is only in its 4th year, I’ve always had a great time at the Eastside Food Fest. It feels like hanging out with friends, at the Mack Sennett Studios! Some great new participants like Cosa Buona, Fat Dragon, RBTA, We Have Noodles, as well as ESFF mainstays like Button Mash/Starry Kitchen, Ohana, and more! There will be panels, demos, and more! Tickets are $95 for VIP (one hour early entry), $65 for GA, and $50 for designated drivers/non-drinkers! Monday the 23rd – Los Angeles Times’ The Gold List: This event has moved around and changed names in past years but is the launch party for Jonathan Gold’s 101 Best Restaurants list! This year it’s known as The Gold List and is taking place at The MacArthur. 30 of the top restaurants in town will be there–and highly likely, though not guaranteed, to be on the 101 list–including Animal, Bestia, Howlin’ Rays, Maude, Mozzaplex, RiceBar, Shunji, Taco Maria, Trois Mec, and more! Tickets are $135. Saturday the 27th to Sunday the 29th – Taste Talks: I had such an amazing time at Taste Talks last year. The first day had great panels and then the second day had a cookout! This year, they are combining both in one day at Mack Sennett Studios, so people can go back and forth between eating and attending the panels, discussions, etc. The conference schedule isn’t up yet, but there’s a partial list of folks who’ll be their, for either the conference or the cookout, or both! They include the Badmaash clan, Ellen Bennett/Hedley & Bennett, Katsuji Tanabe/Mexikosher, Michael Fiorelli/Love & Salt, Christian Page/Cassell’s, Jon Yao/Kato, and more! There is also a kick-off dinner on Saturday. Tickets are $149 for an All-Access Pass to the entire weekend’s festivities, or $99 for the Saturday dinner, $79 for the Foodie Pass (conference + cookout), or $49 for the cookout. The middle weekend of October is chock full of events–four that I know of, and probably more that I’m missing. 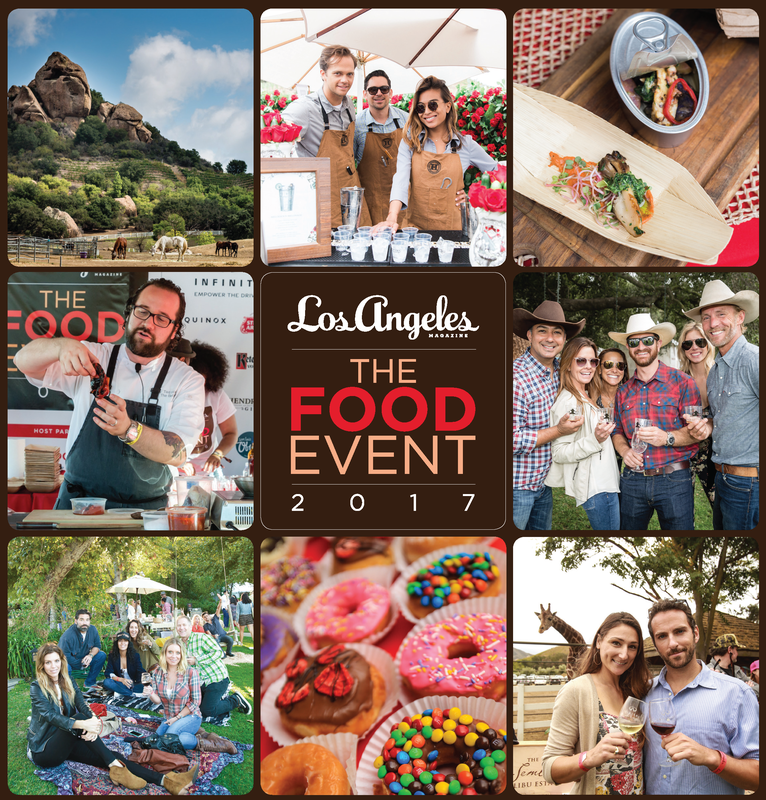 The big one I’m looking forward to is Los Angeles Magazine‘s The Food Event! Just the daily paper of record has their The Taste event each year, and the alt-weekly has The Essentials, L.A.’s monthly glossy magazine has its own headlining event that takes this year on Sunday, October 15th, at Saddlerock Ranch in Malibu, the most picturesque venue of all of the L.A. food events I’ve attended. Participating restaurants include 71 Above, Estrella, Guerrilla Tacos, Here’s Looking at You, Michael’s, Republique, The Bellwether, and more! Tickets are $130 or $145 with the after-party. Sunday, October 15th – Brunch at the Races: If you like pancakes and waffles, you’ll love this event! Featuring restaurants such as Bru’s Wiffle, Du-Par’s, Myke’s Cafe, Poppy & Rose, Barbara Jean, and more, this festive event takes place literally at the races, at the Santa Anita Race Track in Arcadia. Tickets are $45/$65 for GA/VIP, the latter of which gets you a swag bag and access to VIP seating/bars but no early entry. Prices are $5 more at the door. There’s also a deal to buy 4 tickets for $120, which does save quite a bit of money. Sunday, October 15th – March of Dimes’ Signature Chef Auction: This swanky fundraiser is taking place at Union Station this year and features Otium, Scopa Italian Roots, Firefly, Hot’s Kitchen, Sugarfish, and more! This is first and foremost a fundraiser, so tickets start at $400 and go up from there! Upcoming events in Late October: Eastside Food Fest on Sunday the 22nd, Los Angeles Times’ The Gold List on Monday the 23rd, Taste Talks from Friday the 27th to Sunday the 29th, and more! One of my favorite events falls in early September, when fatigue from LAFW and The Taste is just settling in–#foodworldproblems, I know. But this event, LA Loves Alex’s Lemonade, I would have to say is possibly my favorite each year, and it’s happening this Saturday, September 9th! Benefitting Alex’s Lemonade Stand Foundation, LALAL (as the cool kids call it) came about after Suzanne Goin & Caroline Styne (a.o.c., Lucques, Tavern, the Hollywood Bowl now even), and Suzanne’s husband David Lentz of Hungry Cat, went to Philly to help chef Marc Vetri with his fundraiser years ago, and decided to start their own, now in its 8th year! And you can see more on IG with hashtag #offalolemonade. Just to give you a taste of what you might be in for if you buy tickets. Since it is a fundraiser, the tickets are a bit on the spendy side at $195, though $95 is tax deductible. And kids 12 and under are free with accompanying adult! Upcoming events in October: James Beard Foundation’s Taste America Benefit Dinner on Sunday the 6th, Pier del Sol on Sunday the 8th, Off the Hook on Saturday the 14th Brunch at the Races on Sunday the 15th, The Food Event on Sunday the 15th, March of Dimes’ Signature Chef Auction on Sunday the 15th, Eastside Food Fest on Sunday the 22nd, Taste Talks from Friday the 27th to Sunday the 29th, and more!